Now that we have a better understanding of how a NEC VSL0010-A vacuum fluorescent display (VFD) works, figuring out its control pinout with the help of an inkjet power supply, we returned to the carcass we salvaged that VFD out of. Now that we knew each pins’ function, we picked those that supplied 2.5V AC for filament power to track. We expect they are least likely to pass through or be shared by other devices. We traced through multiple circuit boards back to the main power transformer output plug. We think it’s the two gray wires on the left side of this picture, but our volt meter probes are too big to reach these visible contact points. And the potential risk of high voltage made us wary of poking bare wires into that connector as we did for the inkjet power supply. Our solution came as a side benefit of decision made earlier for other reasons. Since we were new to VFD technology, our curiosity-fueled exploratory session was undertaken with an inexpensive Harbor Freight meter instead of the nice Fluke in the shop. Originally the motivation was to reduce risk: we won’t cry if we fry the Harbor Freight meter, but now we see a secondary benefit: With such an expensive device, we also feel free to modify these probes to our project at hand. Off we go to the bench grinder! A few taps on the grinding wheel, and we have much slimmer probes that could reach in towards those contacts. Suitably modified, we could get to work. There was also a single light-blue wire adjacent to the pair of dark blue wires. Probing with volt meter indicated it was a center tap between the dark blue pair. Once determined, we extracted the transformer as a single usable unit: there was a fuse holder and an extra power plug between it and the device’s AC power cord. We’re optimistic this assembly will find a role in whatever project that VFD will eventually end up in. 2.6V AC can warm filament, rectified 26.6V AC should work well for VFD grid and segments. And with proper rectification and filtering, a microcontroller can run off one of these rails. It’ll be more complex than driving a LED display unit, but it’ll be worth it for that distinctive VFD glow. One of the reasons LED has overtaken VFD in electronics is reduced power requirements. Not just in raw wattage of power consumed, but also the varying voltage levels required to drive a VFD. The NEC VSL0010-A VFD whose pinout we just probed ran on 2.5V AC and ~30V DC. In contrast, most LED can run at the same 5V or 3.3V DC power plane as their digital drive logic, vastly simplifying design. We didn’t have a low voltage AC source handy for probing, so we used 2.5V DC. We expected this to have only cosmetic effects. One side of our VFD will be brighter than the other, since one side will have a filament-to-grid/element voltage difference of 30V but the other will only have 27.5V. But putting 2.5V DC on the filament occupied our only bench power supply available at the time. What will we use for our 30V DC power source? 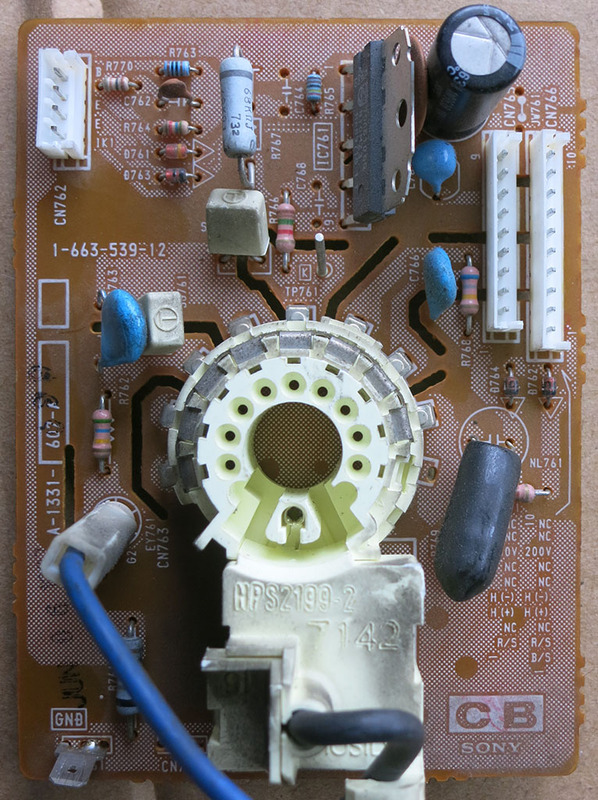 The answer came from our parts pile of previously disassembled electronics, in this case a retired HP inkjet printer’s power supply module labeled with the number CM751-60190. We do indeed have a ground wire in the center, but there is only one power supply wire labelled +32V/+12V. It actually delivers “32 or 12” volts, not “32 and 12” volts. That last pin on the left has an icon. What did that mean? Our hint comes from power output specifications: +32V 1095mA or +12V 170mA. We deduced this meant the icon is a moon, indicating a way to toggle low-power sleep mode where the power supply only delivers 12V * 170mA = 2 watts vs. full 32V * 1095mA = 35 W.
With that hypothesis in hand, it’s time to hook up some wires and test its behavior. When “sleep mode” pin is left floating, voltage output is 32VDC. When that pin is grounded, voltage output drops to 12VDC. Since we’re looking for 32VDC to drive our VFD grid and elements, it’s easy enough to leave sleep wire unconnected and solder wires to the remaining two wires to obtain 32V DC for our VFD adventures. Vacuum Fluorescent Display (VFD) technology used to be the dominant form of electronics display. But once LEDs became cheap and bright enough, they’ve displaced VFDs across much of the electronics industry. Now a VFD is associated with vintage technology, and its distinctive glow has become a novelty in and of itself. Our star attraction today served as display for a timer and tuner unit that plugs into the tape handling unit of a Canon VC-10 camera to turn it into a VCR. A VFD is very age-appropriate for a device that tunes into now-obsolete NTSC video broadcast for recording to now-obsolete VHS magnetic tape. Obviously, in this age of on-demand internet streaming video, there’s little point in bringing the whole system back to life. But the VFD appears to be in good shape, so in pursuit of that VFD glow, salvage operation began at a SGVHAK meetup. This was enough of a preliminary scouting report for us to proceed with desoldering. Predating RoHS solder that can be finicky, it was quickly freed. Now we can see its back side and, more importantly, its part number which immediately went into a web search on how to control it. The top hit on this query is this StackExchange thread, started by someone who has also salvaged one of these displays and wanted to get it up and running with an Arduino. Sadly the answers were unhelpful and not at all supportive, discouraging the effort with “don’t bother with it”. We shrugged, undeterred, and continued working to figure it out by ourselves. If presented with an unknown VFD in isolation, the biggest unknown would have been what voltage levels to use. But since we have that information from probing earlier, we could proceed with confidence we won’t burn up our VFD. We powered up the filament, then powered up one of the pins visibly connected to a grid and touched each of the remaining ten non-grid pins to see what lights up. For this part of the experiment, we got our 32V DC from the power supply unit of a HP inkjet printer. We then repeated the ten element probe for each grid, writing down what we’ve found along the way. We hope to make use of this newfound knowledge in a future project, and we hope this blog post will be found by someone in the future and help them return a VFD to its former glowing glory. When [Emily] found her Neato vacuum in a thrift store, it had an advantage over mine in that hers still have the company of its charging dock. This is our first look at a Neato robot vacuum charging dock and a chance to determine how one worked. We wanted to have some idea of what to expect when we put it to work charging newly installed replacement batteries. The charging dock is designed to sit against a wall. The two metal strips are obviously for supplying power, as they line up with the two metal wires at the back of a Neato vacuum. When the dock is plugged in, a volt meter reports 24V DC between those two plates, top plate positive and bottom plate ground. Each of the plate is mounted on a piece of spring-loaded plastic that allows approximately 3-5mm of horizontal movement. A Neato vacuum can press its wires against these plates to draw power. Above the plates is a black plastic window, we expect something behind that window to communicate with the Neato so a hungry robot vacuum knows where to go to feed itself. How does it work? We hypothesized there are infrared emitters and receivers behind that panel, functioning like a consumer electronics remote control, to talk to a Neato vacuum. The orange tab on top looked very inviting as a way to open the dock. A bit of fiddling later, the dock was open. It was surprisingly simple inside. There was an AC power supply delivering 24V DC. It has a standard power cable on the input side, which can be routed to exit either side of the dock. This way a user can swap as needed to point towards the nearest power outlet, and possibly swap for a longer standard power cable if necessary to reach an outlet. The output wires of the power supply lead to the two metal plates, and that’s it. Surprisingly, there’s nothing visible behind the black plastic window. The IR emitters and receivers we expected were absent, as were any circuit boards with components to communicate with the vacuum. So this charger dock location beacon must work passively. Now we’re really interested in finding out more. How does it work? The black plastic window were held in place with a few clips. They stood between us and knowledge and were quickly dispatched. We were afraid the black plastic might be glued in place, but fortunately that was not the case and it popped off for us to see underneath. We see a pattern laid out with two types of surfaces. The white segments are highly reflective much like the stripes on high visibility orange safety vests. The black segments are presumed to provide a contrast against the white parts. We found out earlier that a Neato lidar data stream returns both distance and intensity of reflections it saw. The distance is useful for navigation, but using just distance information the charger would be an unremarkable flat surface. This is where intensity comes into the picture: these surfaces behind the black plastic window will create a distinct pattern in reflection intensity, something a Neato robot vacuum can seek to find its charging dock. We now know enough to try creating our own charging docks. Userful when we have Neato vacuums found at thrift stores without their charger. Before we tackle new projects, though, let’s see how a full Neato system works in practice. This SGVHAK teardown project came courtesy of an electronics waste bin. A nondescript box with a USB cable, it has three moving parts on top of a heavy base. The center piece takes up majority of width, and two far smaller pieces sitting on either side. Each piece can be pressed down and we can feel a tactile click of a switch. It has a respectable heft and doesn’t look damaged or even worn. It feels rather beefy and unlikely to physically break. A label on the bottom of the device lets us know it is version 14 of the Infinity IN-USB-2 foot pedal. Which explains its mass and durability: this box was designed to sit under a desk and be stepped on. A box sitting out of sight explained its raised side pedals allowing its user to find them by feel. A few screws on the bottom held a plate in place, easily removed. We see a few springs for the pedals, and two pieces of metal that gave the device its heft. There were a few visible plastic clips holding individual pedals in place, but they were only the first line of defense – unclipping them allowed individual pedal to move a little further but did not release them. There were also a few hinge pins that could be removed, but again it allowed additional movement but did not release. The two shiny metal weights were held by tenacious stretchy glue. We could pry them up far enough to see they weren’t obviously hiding screws, but we were wary to apply addition force as it threatened to break apart the plastic housing. Without an obvious way forward for nondestructive disassembly, we decided to pause and reassemble the pedal to see if it can be useful intact before we risk destroying it. My computer was running Ubuntu at the time, which gave us a starting point with the dmesg tool to see what kind of greeting it has to say to my computer. So far everything looks in line with the manufacturer’s name we found earlier. It also tells us the device conforms to USB HID (Universal Serial Bus Human Interface Device) specification. The final line also hinted us to a newly visible device under the path/dev/hidraw9. This path is owned by root, so further experimentation requires taking ownership of that path to see what we can do with it. Now we can try treating it as a file with the cat command. Every time we press or release a pedal we get some kind of visual feedback but we don’t understand it. We then tried treating it as a serial port using minicom but that didn’t get us much further. It vaguely resembles the garbage that might occur if a baud rate setting is incorrect, but changing baud rate in minicom didn’t do anything. Probably because it’s not a serial port! Since the device was classified as a USB HID v1.00 Device, the next thought was to try communicating with it via some sort of HID API for developers. But USB HID is not a trivial thing and after a half hour of following and reading links to documentation I was no closer to talking to the pedal in a “proper” way. So I tabled that approach and returned to treating it as a file. It’s pretty trivial using Python’s file APIs to open it up for reading. Reading a few bytes at a time, we figured out the device sends two bytes upon every action. First byte is a bitfield indicating pedal status, and the second is always zero. The leftmost pedal corresponds to the least significant bit 0x1, then center pedal 0x2 and right pedal 0x4. So if both right and center pedals were both pressed, it would give 0x6. Here’s a simple Python loop that reads two bytes at a time and outputs to command line. The output if I press and release the left, then repeat for center and right pedal. Not every action will trigger data events. There’s a small time window where separate events are collapsed together for a single notification. If I’m quick enough on the press and on release, I can push the right and left pedals simultaneously for a single 0x05 report, then release simultaneously for a 0x00 report, without any intermedia reports of 0x04 or 0x01. This is a very promising set of experiments indicating that, if it should be necessary, we can write code to make use of this pedal in Linux without digging through all of HID API. With that knowledge under our belts, experimentation then moved to Windows 10, which immediately recognized it as a USB HID and even shows us the name. However, it doesn’t do much without further help. Searching for answers on the web, we learned this device was designed for people transcribing audio recordings into text. The pedals allow them to control sound playback (pause, play, rewind, etc.) without taking their typing hands off the keyboard. I’m sure this is a productivity boon for its target audience, but that wasn’t us. Fortunately, the manufacturer has also released a piece of software call Pedalware which will allow this pedal to be used outside its designed scenario, like emulating keyboard keys or mouse buttons. I thought it sounded interesting enough to try. And this is where we started getting a hint why this device has been retired… this piece of hardware’s associated software is old. Pedalware’s installer demands Windows 7 or earlier and refused to run under Windows 10. At this point, Windows 10 backwards compatibility module kicked in and offered the option of running in compatibility mode. I accepted. That was enough to get Pedalware up and running on my Windows 10 computer. Now I can assign an arbitrary keyboard or mouse action to each of three pedals. This worked fine in everyday web browsing and productivity applications. It is, however, too slow for gaming purposes. The aforementioned time window seen under Linux, which collapsed multiple events into a single event, manifests here as well resulting in foot click actions getting lost in high-speed gaming action. But that’s fine, the device was never intended to be a gaming peripheral. The real problem comes from its driver software becoming unreliable as a computer goes into low-power standby. When the computer resumes, the pedal doesn’t always come back into action. And once it gets stuck, the only way to get it back is a full reboot. This was a sign of the times when this device was designed. I remember when many peripherals would not gracefully handle a computer going to sleep, which meant I typically leave my computer running in the Windows XP/Vista/7 days. Computers have gotten more power efficient over these years but it’s still better to put them to sleep. Also, modern USB peripherals are much better about resuming from sleep. But this pedal does not, and that’s probably why it was retired. Fortunately, my work does not require a predictably functional foot pedal, so I’ll keep it around and try using it on the occasions when it works. I brought an old LED light bulb to a SGVHAK meetup for an educational dissection. This bulb has illuminated my front porch for several years, hooked up to a light-sensitive fixture that turns on the bulb when dark, and turn it off when the sun is up. However, when illuminated this bulb has started flickering. At first it was a mild pulse that I didn’t mind very much as I don’t usually need the light myself anyway. But after a while, the blinking started getting annoying and even the bright pulses were too dark for the light to serve its intended purpose. This bulb was retired, and now we take it apart to see what’s inside. Looking inside the cooling vents, we can see there are two circuit boards mounted at right angles to each other. Obviously there will be LEDs soldered to these boards, with a power supply at its base. Since all the LEDs pulsed together, we expect there to be a power supply failure and hope we might be able to see what component caused the problem. Here’s the bulb intact, before teardown began. Here’s the label on the bulb. This was not a bargain basement device, it was a dimmable bulb and it was also designed to be usable in damp environments as the front porch is occasionally exposed to rain. It was also exposed to outdoors wildlife, including some insects who have climbed inside and sadly died there, too. It was nicely sealed with no obvious way to take apart the plastic housing nicely, so out came a beefy cutter and we start cutting from top vents. Once the top vents were clipped open, we could perform some literal debugging of our device by pouring the dead carcasses out. They look like honeybees. Aside from debugging, the opened top also lets us see more details inside. Sadly, there were no visible mechanisms for easy release, so cutting continues at waist-level vents. Once those portions were cut away, we could see more of internals. There were fewer LED surface mount packages than we had expected. At this point I ran out of convenient places to cut with a hand tool, so cutting moved on to a band saw. Once the band saw cut through all around the base of transparent plastic bulb exterior, we were able to free its internals for a closer look. Surprisingly, the circuit boards connect to each other and to the base with tiny spring-loaded connectors rather than a direct soldered joint. One hypothesis is the bulb was not only designed for humid environments, it was designed to sustain vibration as well. Another hypothesis was that humid environments also imply a larger temperature swing, where spring-loaded connectors can accommodate thermal expansion/contraction better than soldered joints. Here is the main board’s topside. Nothing appeared obviously damaged. The big electrolytic capacitor immediately drew our attention, as that is the type of component most likely to fail with age. However, the usual signs were absent. No leaking electrolyte, no bulging of the body, and no breakage in the top. With the help of our multi meter, we could tell the capacitor has neither failed open or failed short. We also measured its capacitance, which won’t be a reliable number as the capacitor is still installed on the board: we’d be measuring capacitance of the capacitor as well as the board it is installed on. But the number was roughly in the ballpark of the rating printed on its side, so it looks clear on all counts. Bottom side of the main showed no such obvious attention-getters. The small light colored surface mount component at the base might be a safety fuse, and it tested OK for continuity. We explore the fewer-than-expected LED modules by trying to power up a single LED using a bench top power supply. At first it stayed dark and we thought maybe the LEDs were at fault instead of the power supply. But then we realised we weren’t giving it enough power: we were surprised it took over 24 volts before a single module would illuminate. An explanation surfaced once we adjusted camera settings to see individual light sources inside the package: there are actually ten LEDs in each package, in a three + four + three configuration. This explains how it could be so bright with so few surface mounted modules! At this point we’ve verified all the discrete components we understood and could test, we’ve removed dead bug remains that might have caused problems, and we cleaned up all the electrical connectors. Maybe that’s enough to bring this bulb back to life? Sadly, the answer was no. We hooked it up to AC power and plugged it in: it is still dim and blinky. Obviously we failed to understand how this particular bulb works – the power supply circuitry was far more complex and sophisticated than we had expected. But still, it was fun to look inside a premium (for its day) LED bulb. On the one hand, I love many Disney properties. On the other, I’m very clear Disney wrings every penny out of their fans. Disney Infinity was a video game where new characters and capabilities are acquired via purchase of physical figurines. Advancement in the game requires a steady stream of new figurine purchases. As much as I love both video gaming and Disney properties, that was too much of a money grab for me to put up with. Apparently enough people thought the way I did, because Disney shut it down for not making enough money. Ironically, that announcement is why I now have a Disney Infinity starter pack: once the announcement was made, these kits went on the clearance rack for drastically reduced prices. I was not interested in paying their full price, but I can certainly spare $5 for a gaming peripheral with no future just so I could take it apart! It took a while for me to get around to this project, which finally happened at a recent SGVTech meetup. This starter pack came with the system base, Merida, and Stitch. Based on how the game worked, we expected a RFID-based system. That implies RFID chips in the bottom of these figurines, and the USB-connected base has coils to read them. Expectations on these fronts were met but there were a few surprises on the way. The plastic top of the base were held with a few clasps that were easily broken. 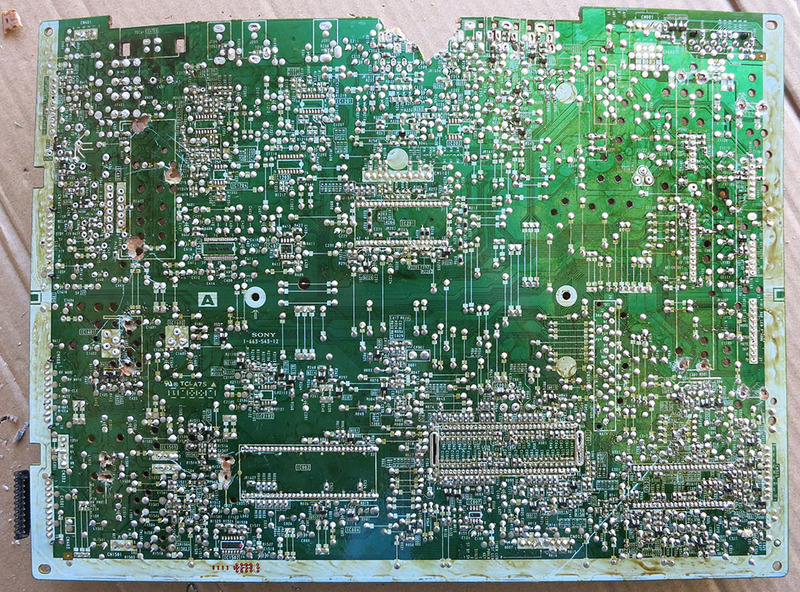 Once removed, we could see three white PCBs each with what appears to be a surface mount LED on top, and a green PCB with connections to each of them and the USB cable. When we flip over one of the white PCB, we could see it is a simple single layer design and its RFID coil is visible. The straight lines towards the middle are for driving the LED. The control board is a more typical multi layer board. The biggest chip on board is from the STM32 family, specifically the STM32F072C8T6. Typing the numbers printed on top of next two larger chips into a web search didn’t return any useful results. The LED on each white PCB appears to have four leads. When we saw four leads our first thought was an addressible LED with power, ground, data, and clock. Then we remembered this is a toy built to low cost: it’s more likely a RGB LED package with a common anode and three cathodes, one per color. Either that or the reverse with a common cathode and three color anodes. The ‘+’ labelled on its PCB hinted at a common anode design, which was confirmed with a quick test using a bench power supply putting power on some exposed pads. Aside from the RGB LED, there’s not much of interest from these three white PCB I could pull off and reuse. The main green PCB was more sophisticated, and there were exposed pads on the bottom that hint at the possibility of reprogramming the STM32 for something fun, but that’s beyond my current skill level. (This guy can probably do something with it.) The part of the board with best potential for reuse is its USB connection. It gives me a USB-A connector for plugging into a computer, and the other end is a nice modular connector with 2mm pitch. This will be useful the next time I want to hack a standard USB cable onto a device. Attention then turned to the other part of this system: the figurines. Once the clear plastic portion was removed, its RFID sticker is accessible. Sadly, Stitch’s arms did not survive the process of prying apart his base. A closeup of RFID sticker showed most surface area is antenna, and that tiny black dot is a chip with the secret code to unlock a Stitch character in a Disney Infinity game. People online have tried to hack these bases with little success. Given that the revenue stream comes from selling figurines, there was a robust security scheme to protect the game against counterfeit tags. I was not interested in exploring the digital side in any case, this was strictly a physical teardown. In her movie Brave, Merida was guided by little blue glowing wisps. In the figurine, a wisp floated by Merida’s foot. As a ghostly entity, it was fittingly cast in translucent plastic. But there was an extra detail: the translucent plastic went all the way through the opaque parts of the stand, so it could pick up LED illumination from the USB base. When it glowed with a blue LED, the wisp would glow blue just like in the movie. This bonus showed the artists were thinking about how to best take advantage of this medium. Too bad such creative thoughts were infrequent (Stitch had no such attraction) and probably went unnoticed by most buyers. The final piece – hexagonal tiles for some purpose or another – were unremarkable. Once the transparent and opaque pieces were pried apart, a similar RFID tag could be removed. I didn’t see any interesting possibilities for reuse. My project at last night’s SGVTech meet was to dig into a nonfunctional cordless water flosser, the Waterpik WF-03. I added this to my evening tooth brushing & flossing routine upon recommendation of my dental hygienist, and it worked for several months before it stopped running. At first I thought it just needed new batteries, but when I opened the watertight battery compartment, out poured brown water along with the three AA batteries. Clearly something has failed inside the device. There were no obvious ways to disassemble this device, which I’m sure is partially motivated by a desire to control water intrusion. Given the high potential for disassembly to be a destructive process, it’s not realistic to expect I could repair the device and return it to service. But somewhere inside is a battery-powered water pump designed to deliver short high pressure pulses, and I am confident I can find a fun use for such a device in the future. The first thing I tried was prying off the silvery front panel. I had hoped maybe it was held by clasps, but it was clearly glued in place. I had also hoped there would be fasteners visible below this panel, but no luck. The only visible part is the switch controlling high/low/off operation. Prying at various places of the plastic enclosure by hand, the only parts that moved at all were near the bottom, flanking either side of water resorvoir. I started prying by hand and, when that wasn’t enough, moved on to a screwdriver. Looking at the seams I broke apart with the screwdriver, the plastic components are either glued or welded together. There’s definitely no turning back in this disassembly. Once the screwdriver pried a few pieces of plastic open, I could enlist the use of pliers to continue pulling plastic apart. Once I could see enough into the interior to have a good idea where a cutting blade could do some good, a hack saw was enlisted to finish the job. Once the front outer shell is cut all the way around the base, the mechanical guts slides out easily. There’s a smaller piece of enclosure on the back, designed for the water reservoir to slide and clip into. Removing this required removing the water intake pipe O-ring (visible in lower left of picture) and removing two screws. Once the back was removed, we are free to disassemble the central cylinder. It bottom was secured to the battery tray via four screws, and its top was held to the water intake and valve assembly with four more screws. Here’s another view of the disassembled parts, laid out roughly analogous to the way they were when assembled. Once we could see the motor gearbox assembly inside that cylinder, it was clear why this device stopped working: water has leaked past the diaphragm (black) and made its way to components below that point. If there were any lubrication on the gears, they have been washed away. And the motor’s external casing has corroded. It was not possible to move this mechanical assembly by hand, so we took it apart to see what has seized. When the motor was removed, it looked even worse than expected. Trying to turn its output shaft using fingers found it unwilling to move. But we were able to un-seize the shaft, possibly helped by an unintentional drop to the ground. Then after cleaning it up a bit and adding some oil to the bushings, it spins up again! Markings on this little motor proclaims itself to be genuine Mabuchi. Whether it is indeed the real thing or a knockoff manufacturer brazenly using the name I can’t tell, but any motor that can survive abuse, end up looking like this one, and still spin up again has my respect. We reassembled the water pump core and it was pumping water again. We could pump water past the point where a Waterpik nozzle would mate with a rubber O-ring, but it started leaking out past that point as those sections weren’t designed to control water flow. I didn’t expect the pump to be so tightly integrated with the nozzle socket assembly and didn’t bring one of my spare Waterpik nozzles. But that was no barrier: we fashioned a substitute using a short length of pneumatic hose and parts from a ball point pen. I wouldn’t use this for my dental home care anymore, but it’s certainly going to sit in my pile of interesting parts awaiting integration into a future project. The best part of a local meetup is having different people bring in cool things that I would never have encountered in my own life. This week’s SGVTech meet is a prime example: I got to look inside an old hair removal laser. This is a product category I didn’t even know existed beforehand. Reading the product’s web site, it proclaims itself to be far more powerful than any of its competitors on the market, second only to medical grade equipment not sold to consumers. I don’t know if that is true, but power is certainly a theme. There are multiple safety hoops the consumer must jump through. A skin tone sensor in the base must verify the user’s skin color is within an acceptable range before it will even power on. And before the laser will fire, a secondary verification performed by a different sensor in the tip must pass. The motivation for tonight’s teardown is the power subsystem. When plugged in for charging, the device gives all the indication of successful full charge, but it could never go through the first stage of its extensive power-up procedure. The manufacturer does not supply replacement batteries: while it’s possible the device is no longer safe to use beyond the life of the battery, it’s also easy to be more cynical about planned obsolescence. Tonight’s mission is to open it up and see if it can be brought back to life. The exterior enclosure is an impressive work of industrial design, presenting a user-friendly appearance that hides the power and sophistication within. Popping a few plastic clips unveiled the device is dominated by equipment supporting a powerful laser. The battery module consumes majority of the interior volume, followed by a large heat sink and fan for thermal management. The battery pack consists of two cells, and our first surprise was the 3.2V nominal volts listed on its label. This typically indicates lithium iron phosphate (LiFePO4) battery cells, which is known for high power delivery befitting a high powered handheld laser. However, these cells typically trade off power delivery with lower power capacity, but this pack claims 4.4 AHr which is far higher than any LiFePO4 cell I’ve seen. Tearing apart the outer plastic, we saw the pack is two cells wired in parallel, supported by measuring an open circuit voltage of 3.4. Two cells 2.2 AHr apiece is still very high by LiFePO4 standards. We had a wide selection of battery cells we intended to try swapping in, from NiMH (visible in picture above) to standard 18650 cylindrical lithium batteries to lithium polymer packs intended for high amperage draw remote control vehicles. But before we start hooking up batteries, we should understand what power the device is looking for. So the battery pack’s wires were cut off and replaced with connectors to a bench power supply. We expected the device to power up with the power supply set to 3.2V, the nominal voltage listed on the battery pack, but there was no response. Turning it up to 3.4V was also unresponsive. Something inside this device is looking for a very specific power profile before it will activate. This may be one of the safety hoops, but it certainly dims our prospects of getting it up and running on other batteries. Then a mistake was made: thinking the device might be running into the power supply’s current limit, a hand reached out to increase current but instead turned the knob to increase voltage far higher than 3.4V. A component on the circuit board started glowing and smoking, leaving behind a burnt hole so we can’t even read the part number anymore to figure out what it used to be. Oh well, so much for bringing the device back to life. Now that it is well and truly dead, we have to abort the revitalization project and revert to our typical mode of disassembly for curiosity. The heat sink appeared to be a custom piece of machined metal, even the cooling fan might be custom due to how it clips in a way that conformed to shape of the heat sink. But obviously the star attraction is the laser assembly, and it didn’t look anything like what we expected. Behind the optical assembly we see… two pieces of golden colored metal? Most of our collective experience are with LEDs in plastic packaging. If we use magnification, we can see a little bit of the semiconductor within but they don’t look anything like this. Our ignorance of solid state lasers meant we didn’t understand what we were looking at. Looking on the bright side, maybe it’s just as well we didn’t understand enough to play with it. This is a powerful piece of equipment, operating on wavelengths of light that we could not see. There is no blink reflex to save our eyesight in case of accident. There was a casualty of my laser+speaker Lissajous proof of concept: while exploring the limits of how far I could push a speaker, I went too far and burned one up. It was an unfortunate but expected part of playing with using components outside of their designed purposes. And now the dead speaker has one final role to play: as a dissection subject so we can see what’s inside. This is a irreversibly destructive process because speakers are not built to be disassembled and repaired. Once I plunged the blade into the speaker surround, I am committed. Once the surround was cut, I could access and cut the suspension underneath. After they were both cut I could lift the cone. Several problems were immediately visible. The voice coil that should have been attached to the bottom of the cone has separated, leaving a ring of charred material and a single thin strand of magnet wire. Emphasis on single: there should have been two wires for the coil! Also, lifting the cone released a strong odor of burnt insulation. Since that thin strand of magnet wire is our only connection to the voice coil carcass still buried within its narrow slot, the only thing to do is to tug on it (gently) to unwind the coil. As wires were pulled, they occasionally brought up flakes of burnt speaker with them. Eventually, enough of the obstacles were removed that the charred remains of the voice coil could be recovered. It’s a pretty sorry sight and a fitting company to the smell. The magnet assembly was held on to the speaker chassis by four big rivet-like structures. A drill press was summoned to remove the bulk of the metal. It was novel to see metal shavings align themselves to the magnetic field. After the majority of the rivet were removed, the chassis was placed in a vice and the magnet assembly was pried loose from the chassis. This still left four protrusions to cut flush, and the tedious task of cleanup – the metal chips really wanted to stay with the magnet! But by the end of the night I have a hefty speaker magnet assembly. 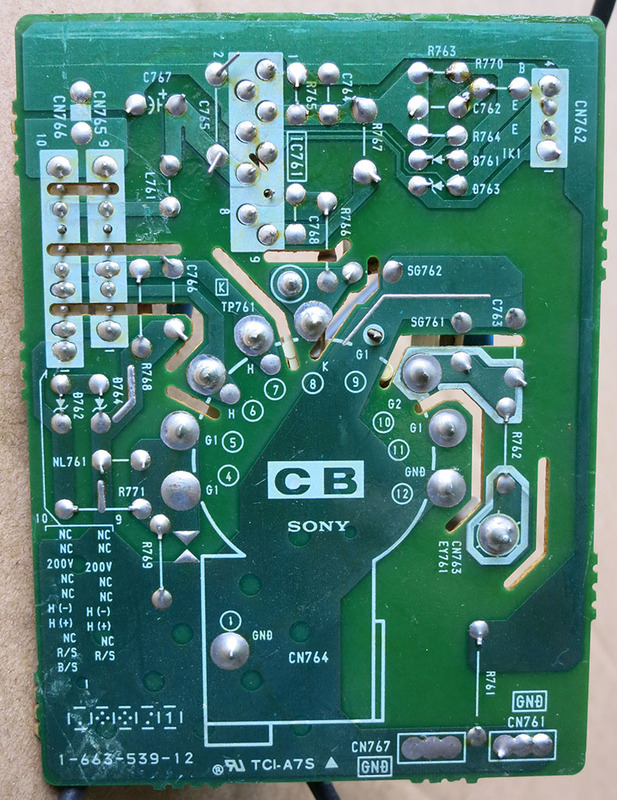 After this electronic vulture picked clean the power handling board “G”, attention turned to the other main circuit board at the bottom of a Sony KP-53S35 TV. There is a big letter “A” marked on the board, but I’m going to call it the signal board because this is where video signals enter the TV. In the lower-right corner are two entry point for RF. (One for UHF and one for VHF?) Adjacent to them are a few sets of RCA jacks for composite video + stereo audio. Finally, this TV’s premium video option in the form of a S-Video connector in addition to composite video and stereo audio. Again there were component heat sinks that were very good at their job, making them difficult to unsolder with heat. So just as before, I turned to mechanical means, but a refined version: instead of ripping them out with brute force, I tried to drill out the attachment points. It is a challenge to make a drill bit stay on point while drilling into the conical profile of a solder joint, but it was easier once things got started. This approach is a trade-off: the brute-force way is fast and appropriate when I don’t care much about damaging parts. The drill method is slower but leaves components better preserved. In this specific case, I’d like to get it up and running again. More details on the next post. But it’s not all about removing big beefy heat sinks, this board also presented opportunity to practice delicacy. The power board was composed exclusively of through-hole parts, which is reasonable considering its job. In contrast, the signal board dealt with lower power levels and employed a few surface mount devices scattered here and there. This is an ideal test case to see if a paint-stripping heat gun can be used to remove surface mount devices (SMD). Great news – it worked! And since SMD parts have far smaller surface area and less raw metal, it took only about 20-30 seconds of the heat gun on high before a pair of pliers were able to gently lift the part. I’m going to continue practicing this mechanical removal process for a while before I worry about function. So it is still unknown whether the chip has suffered heat damage. The signal board had a lot of empty space, reserved for components that were never installed. Best guess: this circuit board supported multiple televisions and these components were to support features that were absent from this specific TV. After high voltage transformer was freed, I looked over the rest of this board. Aside from a big “G” next to the Sony logo, I didn’t find a designation marked on it. I’m calling this the power board just because this is where the AC power cable came into the television. Power enters through a connector in the lower-left corner of this picture. Accordingly, most of the larger components are clustered near that area, implying power handling duties. Many also had thin sheets of metal attached, either as heat sink or as shielding or possibly both. Near the center of the board is a curious connector – it just has a wire that loops back into itself. What could be the purpose of such a thing? A big beefy 20W resistor with very low resistance of 0.82 ohms hint at a shunt, possibly for measuring current flow. Enough looking, time to pull off the interesting looking parts, meaning pretty much every component which is not a resistor or a capacitor. I first started with the ICs on the board as I wanted them to practice free-form circuit building. I doubt my first attempts will look good, so I might as well start by creating circuits around chips that are likely nonfunctional due to excessive heat used to remove them. I had the heat gun hot enough and close enough so solder melted in under 30 seconds. That heat can’t be good for the chip! Emboldened by success removing these little chips in short order, attention turned to the big convergence control modules STK392-110. Sadly their big heat sinks were very good at their job of dissipating heat so I couldn’t reach melting point of solder holding them to the board. I turned to removal via mechanical means, which is a fancy way of saying “ripping that sucker out of there.” I first removed the screws fastening the heat sink to the chip, then started pulling and rocking the heat sink. The metal leg on the right side held strongly to the circuit board and broke the board. The other side, however, is different. The left side of the heat sink seemed to have popped free of its leg which is soldered to board. It looks like a little drilling will be enough to intentionally separate the heat sink from its attachment bracket, and that worked to ease removal of the second heat sink. Once the heat sinks were removed, the heat gun could free the STK392-110 modules. I reunited chip and heatsink for whatever their future holds. Then the heat gun were pointed at the rest of power-handling components. Transformers, rectifiers, etc. They are relatively durable components and are likely to have survived the heat of their removal if I ever dare to use them for a future project. 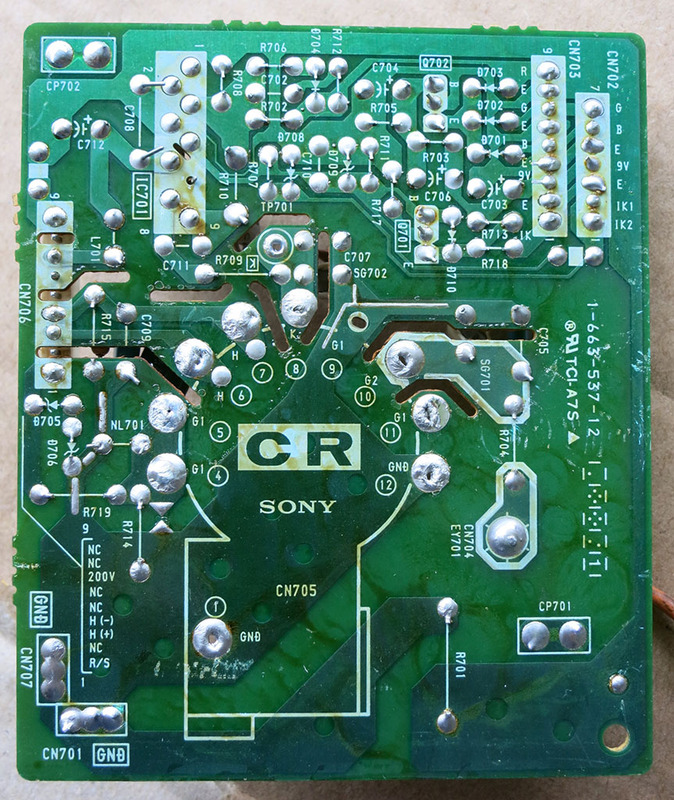 And here’s the aftermath: a heat-charred and distorted circuit board still home to many uninteresting resistors and capacitors. It will be dropped off at electronic recycle. 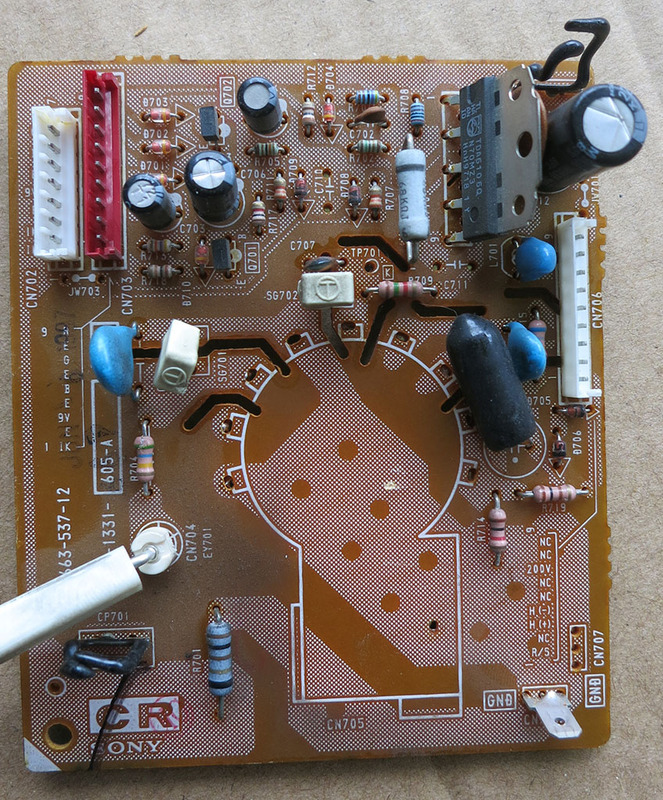 A Philips TDA6106Q is the most sophisticated looking component on the circuit board attached to the business end of the CRT. Datasheet says it is an amplifier, taking input voltage signal (0 to 8V) and amplifying it to a much higher voltage. (0 to 250V) It can handle signals almost up to 6 megahertz. The output pin of this chip can be traced to pin 8 of the tube. Best guess: this is how beam intensity is modulated to create a picture as the beam swept across the screen. Components with big heat sinks always draw attention – they tend to be the most powerful components on the board. Either because they are doing a lot of complicated work, or that they are handling a lot of power. The circuit board with the power supply and high voltage transformer also had a pair of these STK392-110 units. The fact there were only two was curious: almost everything in a rear projection television comes in threes, one for each tube, what purpose would a pair of something serve? Looking up STK392-110 gave us the answer on both fronts: they are high power amplifiers used for the purpose of controlling color convergence. The high power (over 100W) explains the heat sinks, and convergence control explains why there’s only two of them. If we’re working to make sure all three colors converge at the same places on screen, we could leave one color alone and just adjust the other two. This seems to be a commodity part used by many rear projection televisions, and their high power handling meant they do burn out. As a consequence there are replacement modules still available for purchase at very affordable prices. Unfortunately the market is large enough for there to be counterfeit items as well. Now that we got a blurry dot on screen of picture tubes we removed from a Sony KP-53S35 rear projection television… it is encouraging for us to keep going and see how much further we can go. There are two main avenues of investigation: (1) How to make a better and tighter beam, and (2) how to control direction of that beam. To help experiments on making a better and tighter beam, we’re going back to the harvested pile of parts. A control box with three knobs labeled “focus” seems promising. It also has three other knobs labeled “screen” whose purposes we’re not sure about. This box had been mounted with the knobs facing forward such that a technician can access these knobs while looking at the screen. The back side of this box has a few wires. Most significantly, a pair of wires went to each of three picture tubes. In this picture, we still see the wire pairs for the green and blue tubes attached. The empty spots are for the red tube, removed before this picture was taken. The yellow, brown, and upper left corner black wire is unknown. The red wire in the lower left is connected to the high voltage transformer. Pulling the camera back shows the system in a little more context. Close-up pictures were then taken for each of the three picture tube PCBs for future reference. Our earlier experiment used a transformer purchased off Amazon intended for something else – we had hoped its voltage would be close enough, and it was. Now for the best beam we want to get the correct voltage by using the original transformer which generated the voltages for these tubes. It lives on one of the two main circuit boards that had lived at the bottom of the television. This board is where the power cord connected, so it has the power supply and everything relating to high voltage. The transform is still attached to an unit that distributes voltage to the three picture tubes. The transformer isn’t expected to be terribly delicate, so the cheap hot air gun will be deployed. 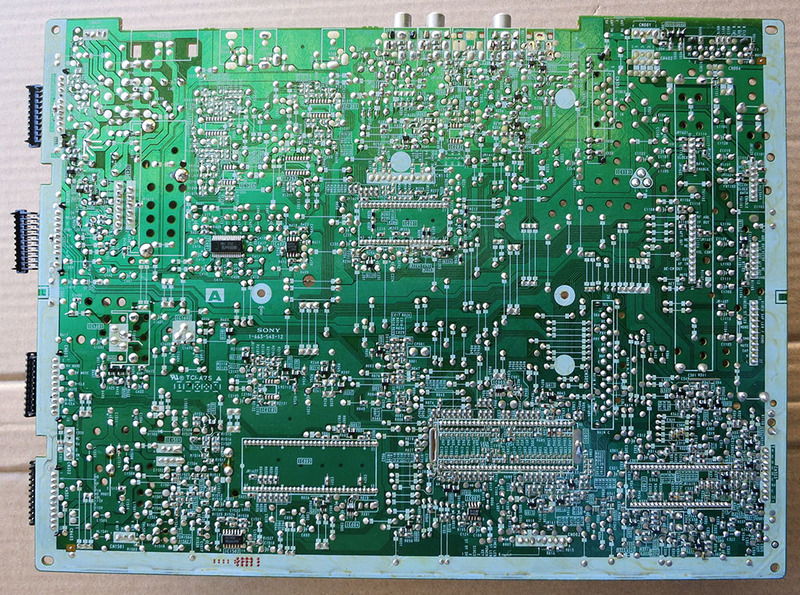 But before that, a picture of its PCB footprint was taken for possible future reference. At a recent SGVTech meetup, newcomer Amir had lots to offer. One item that I picked up on was his assertion that a cheap Harbor Freight heat gun can be a low-cost alternative to fancy electronics hot air rework stations. I have one of those cheap hot air guns in my garage! Designed for home improvement projects like paint stripping, it is a big crude tool. I wouldn’t use it to assemble surface mount devices or anything I actually care about until I get a better idea of what I am doing. I’ll learn to handle it by disassembling parts that are either robust, or that I don’t care about. The very next week, I got the chance to put that idea to the test when [Emily] and I felt inspired to try lighting up a CRT. The original driving electronics are no longer functional due to us crudely tearing them out of the TV, but the tube and a few associated accessories are still intact. To help us play with the tube, we thought it might be a good idea to remove a CRT socket to make it easier to access our tube’s pins. This is the ideal situation for testing the heat gun – a big socket should be robust enough to take the heat of a clumsily applied hot air gun much better than something delicate. 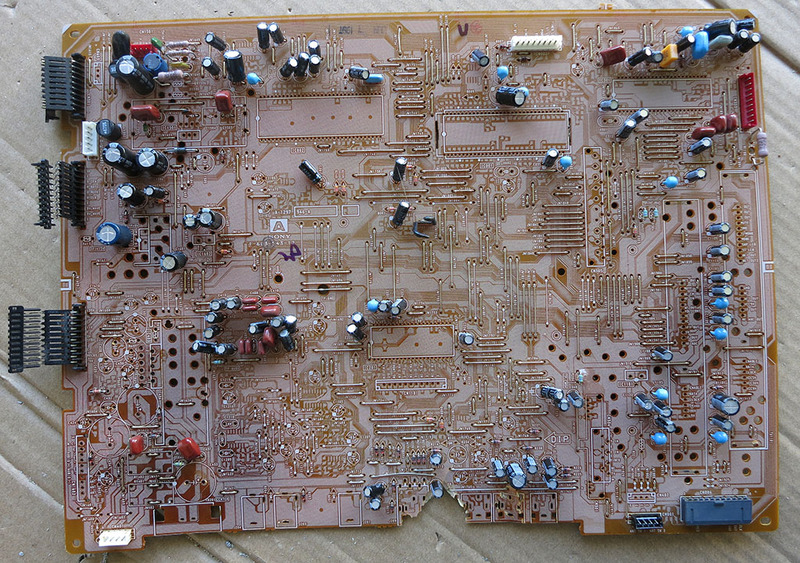 This TV is also old enough to predate ROHS and lead-free solder, so we expect the solder to flow relatively easily. I aimed the hot air gun at the solder joints at low setting. After a minute of inactivity, I turned it up to high. About a minute after that, we could see solder starting to melt. A few more seconds after that, all solder on the socket melted enough for us to remove it. This was much faster and easier than individually undoing solder joints using a soldering iron and a solder removal tool. And the mission was successful: our newly freed socket made it easier to probe terminals and to make experimental connections with alligator clips. I just bought the top-of-the-line Xbox One X in order to play Forza Horizon 4 in 4K HDR. I’ve also reclaimed my old Xbox 360 Halo 4 Edition, which I loaned out to a friend’s family but the children had lost interest in the older console. I got the console itself back, plus my old game library and all accessories. This all started when I went looking for my old Kinect sensor bar, but that’s a story for another time. Physically, the biggest thing in this package was the Xbox 360 Steering Wheel. Built to offer realism through force-feedback and take severe physical punishment, it was big and beefy and takes up entirely too much space. A problem that almost certainly drove its retirement and replacement by a much smaller controller. Since it is not compatible with my new console, where I can play all four Forza Horizon games, I see no reason to keep it around in running condition. Which means it is time for some fun! I brought it to our weekly maker meetup where we can tear into this relic of the past. The big wheel is set aside for now. We’ll start with the pedals. These are designed to sit on the floor and take the force of frantic game players stepping hard on them. They are made of extremely sturdy plastic with surprising heft. It was straightforward to open up, where we can see it is fairly simple inside. All the force gets dissipated by heavy duty springs and metal brackets into the beefy plastic, leaving only the rotational motion to be read by simple position encoders which are likely just inexpensive potentiometers. That done, we start tearing into the wheel itself. Most of the visible screw holes are at the bottom, where it is curved to fit on our laps. Unlike the pedal unit, these screws are “security screws” with a post in the middle of the Torx shaped fastener. It proved to be a minor annoyance but easily overcome with brute force as we don’t care about putting it back together. After the “lap desk” layer was removed, we repeat the process for the actual enclosure. A lot of destroyed fasteners and plastic later, the innards of the steering wheel is visible. As expected, it is mostly empty space. To the left is a control board with three wire bundles leading to the rest of the wheel. There’s one controlling the motor to provide force feedback, one to a sensor to read steering wheel angle, and a wiring harness going through the center of the steering shaft to the wheel-mounted controls. Here’s a closeup of the force feedback motor and gearbox. Mechanically, this area takes the brunt of forces players would apply to the steering wheel. So I expect I can reuse this robust assembly in a physically demanding project in the future. However, it proved to be tricky to remove. The four obvious screws release the metal plate, but that is only part of the assembly. There had to have been fasteners coming in the opposite direction, but none were clearly visible. By process of elimination, we eventually figured out the screws were hidden under a stealthy sticker that matched its surrounding color and shape so well we didn’t realize it was a sticker. After that discovery, it was trivial to remove the motor gearbox assembly. The main board was also removed for examination. The electronics people in the room looked over the board and noted the main processor has a Microsoft logo on it. We had expected to find name and designation for a microcontroller we might reprogram, but this is a custom chip. Teardown proceeded to the wheel unit itself, where we found another surprise: The big motor isn’t the only one providing tactile feedback. The bottom left and right corners of the steering wheel also housed vibration motors. The two motors appeared identical, but they had different sized weights affixed to their output shafts to produce different tactile sensations for users’ palms. The shifter paddles in the back of the wheel also had to take some punishment, as people can pull on those pretty hard. Again, a lot of mechanical design dissipated any over exuberant energy into sturdy plastic pieces and metal springs, leaving just a simple mechanical motion to press on small push buttons on the back side of the wheel circuit board. Remainder of the in-wheel PCB was unremarkable with standard buttons. The physical wheel we hold in our hand, however, was interesting. Its weight led to speculation that it might have metal weights inside or possibly be formed from a steel tube. We put it through a metal-cutting bandsaw and found that it was solid heavy plastic all the way through. Three layers are visible: The crudely formed center (dark gray) which is likely just a C shape. Then a more precisely formed plastic layer was formed over it (lighter gray) which probably also formed the center of the wheel housing all the buttons and PCBs. Then finally, a soft rubbery rim was formed over that, with a dimpled texture for grip. This steering wheel controller was a lot of fun in its prime. It felt great in the hand making its best effort at realism. The robust construction took all manners of abuse (from children and grownups alike) without any sign of damage. This wheel was definitely not flimsy! I appreciated seeing all the work that went into making such a robust gaming peripheral. Now all the potentially reusable parts like motors, springs, gearboxes, and electronics have been harvested and put away, consuming far less storage volume than the entire wheel and pedal assembly. The remaining (beefy) plastic is on their way to a landfill. When we took apart the big old rear projection television, the same family also had an old VHS camcorder from the 1980s slated for disposal. [mle_makes] took it off their hands and merrily started taking it apart for fun components. First component to be brought to our weekly SGVHAK meetup was the viewfinder’s tiny CRT. I brought the box of Sony KP-53S35 salvaged RPTV parts on the same day so we could place the two picture tubes side by side with a ruler between them. While the big tube had 21 years of TV watching burned in to the surface, the little CRT looks to be in good shape. (Also, the RPTV tube was likely driven far harder to generate the necessary brightness.) And since the little tube was part of a battery-powered device (12 volt lead-acid!) the picture tube flickered to life with a DC power supply. Viewed from the top, we are reminded how much of a space savings modern LCDs gave us. Both of these tubes are far longer than their picture’s diagonal size. The little tube’s image was remarkably crisp and bright when viewed in person, a fact extremely difficult to capture in a photograph. The 525 scan lines of a NTSC signal meant this little tube was pushing 600 dpi of resolution! All of these images on the tube were generated from an old video conference camera, which had a composite video output port that was wired to the tube’s control board. Here’s one of the test setups, using a scrap piece of paper and a simple smiley face drawn on it with a Sharpie marker. The best picture taken of the tube was when I narrowed the aperture to get a longer field of depth, so the camera is free to focus on something other than the actual picture and still get halfway decent results. (I think it is focused on the edges of the glass here.) An admirable amount of paper texture was conveyed on this tube. A few weeks after this initial tiny CRT demo, it became the centerpiece of this Freeform Mini CRT Sculpture on instructables.com. A large Fresnel lens that’s a core part of the main screen. The large front-surface mirror reflecting picture onto screen. Lens assemblies on picture tubes. Since this might get messy, the doomed TV was moved out to the driveway for dissection. The rear service panel is the obvious place to start. [mle_makes] has taken apart many RPTVs and was recruited as expert guide to the process. [amybaldwindev] has not taken many things apart before and is here to learn. With the service panel removed, we can see the heart of the TV: picture tube and electronics driving them. The rest of a RPTV is basically empty space. Next to be removed was the large rear mirror. I was a little disappointed to find this was an ordinary rear-surface mirror, not a front-surface mirror as I had hoped for. Still, it has many future project possibilities. The largest two circuit boards were mounted on a tray that could slide out for servicing, giving us a better look at the heart of the machine. 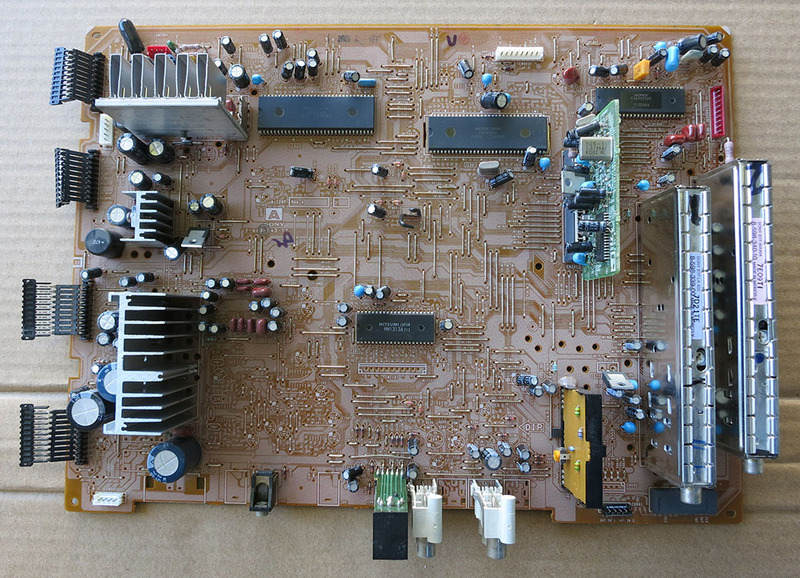 Aside from some beefy-looking heat sinks, there is little desire for whatever’s on these non-HDTV circuit boards. They’ll be stashed away and likely disposed in electronics waste disposal in the future. Old age made the circuit boards uninteresting, but old age made the picture tubes novel. They were removed next, and their focusing lens assemblies removed. With the lens assemblies removed, we can see the picture tube behind a liquid cooling assembly. We knew to expect three tubes: one each for red, green, and blue. And it wasn’t too surprising to see color imparted by colored lenses. What’s puzzling is the fact the red and green tubes got colored lenses…. but the blue one did not. Do these tubes emit blue by default? The three tubes are different in other ways: The red and green tubes had an extra circuit board on their control yokes, but the two boards are clearly different. In contrast, the blue tube had no circuit board on its control yoke at all. Here’s how the three tubes (and their control yokes) were mounted in the case, which may be useful if they are to ever light up again. The coolant (most likely ethylene glycol) in the chamber in front of all three tubes were drained into a glass jar for safe disposal. (Or potential reuse.) Once drained, the cooling assembly was removed to expose the picture tube face. Visible on each face is a burned-in rectangle representing 21 years of TV watching. Due to the geometry of the optical path, the tubes on either side had a trapezoidal pattern (visible here) and the center tube has a rectangular pattern. These large powerful high-voltage tubes are not going to be used for their designed purpose in the future, but the glass work is beautiful and I hope to find an aesthetic way to display them. All the components were stripped off the glass vessel. It’s a bit of a shame, as the wiring in the control yoke has aesthetics of their own. With all the components packed away, it was time to break down the cabinet. It is mostly built from injection-molded polystrene and should be recyclable. This is where a reciprocating saw (the Harbor Freight knockoff of a Sawzall) became very handy. At the end of the day, a big bulky RPTV has disappeared. Its desirable components were packed for reuse, hazardous components were packed for safe disposal, and the remaining cabinet pieces broken up for household waste/recycling. Yet to come: giving these salvaged parts new life. We had an earlier success tearing down a Dell laptop battery pack, where the six salvaged cells still have 70% of original capacity after ten years of service. However, that was from a laptop that could still boot and run from its battery pack. This XPS M1330 battery pack is in far worse shape. How much worse, we were about to find out. The first critical detail was realizing the battery pack was not the original Dell battery pack. It is an aftermarket type of unknown manufacture. The earlier battery pack tear down yielded Samsung cells, we’re probably not going to get anything nearly as nice this time around. Once the case was cracked open the suspicion was confirmed: These appear to be generic 18650-sized lithium cells with no manufacturer branding. The nine cells of the battery pack were divided into three modules in series, each module had three cells wired in parallel. 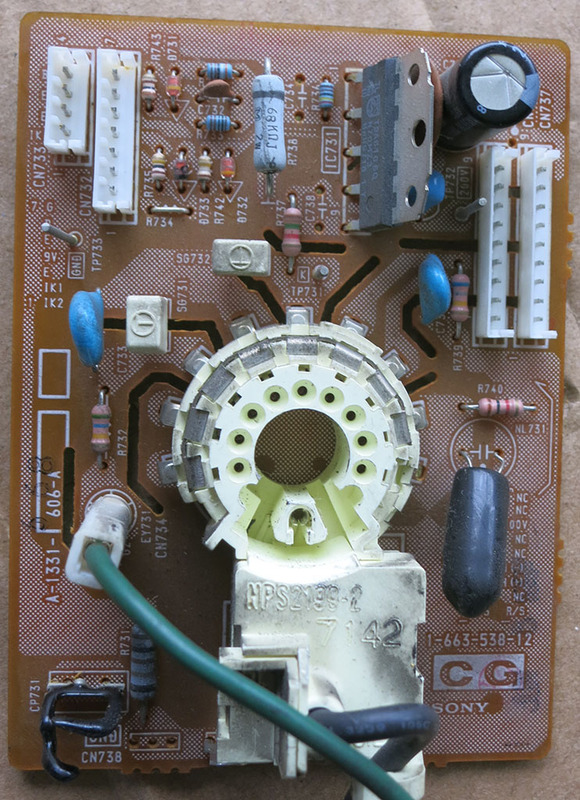 The module in the worst shape exhibited severe corrosion and had no voltage across their terminals. Best case: The metals dissolved into the electrolyte will hamper chemical reaction, resulting in reduced capacity. Worst case: The dissolved metals will reform in a way that damages the cell, but causing it to fail as a closed circuit. Short-circuiting the internals will release a lot of energy very quickly, resulting in high-pressure venting and/or fire. The corroded cells that have discharged down to zero volts have the highest risk and will be discarded. The remaining cells will be slowly (and carefully) charged back up to gauge their behavior. Recently a dead Dell XPS M1330 came across the workbench. The battery was dead and the machine fails to boot. After some effort at reviving the machine, it was declared hopeless and salvage operations began. Today’s effort focuses on the motherboard port for the AC power adapter. The power plug on this Dell different from the typical Dell laptop AC adapter: octagonal in shape rather than round. The shape meant it could not be used on other Dell laptops designed for the round plug. However, the dimensions of the octagon are such that an AC power adapter with the typical round Dell plug fits and could be used to charge the laptop. So while the laptop could be charged with any existing Dell-compatible AC adapter, the AC adapter that came with this machine is specific to this Dell. Once the XPS M1330 died, its octagonal plug power adapter is not useful for other Dell laptops. It still functions as a power supply transforming household AC to ~19V DC so it might be useful for future projects. To preserve this possibility, the octagonal power port will be recovered from the system board. The solder used in Dell assembly was possibly one of the lead-free types and is definitely reluctant to melt and flow. Trying to desolder the power port using hand tools (desoldering wick and hand suction pump) had no luck. So this project was chosen as a practice run of using a dedicated desoldering tool, in this case a Hakko 808. The tip of this tool heats up to melt the solder, and with a press of the trigger an electric vacuum pump pulls the melted solder through center channel of the heated tip and into a chamber for later disposal. The desoldering pump was able to remove more solder than hand tools could, but was still not quite enough to free the port. Using a soldering iron, some user-friendly leaded solder was worked back into the joints to mix with the remaining Dell factory solder. 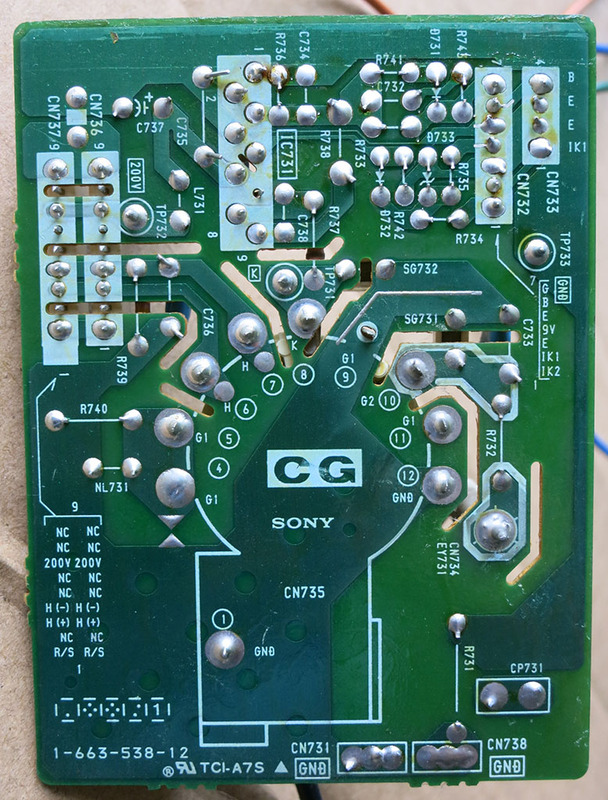 Upon second application of the electric desoldering tool, enough solder was removed to free the port from the system board with only minimal damage. A test with the voltage meter confirmed this port is now ready to be used to provide ~19V DC power to a future project.